With MinistryCom 2006 over and the Innovative Church Conference coming up this week we decided to ask about church communications conferences and what matters most when you decide to attend an event. The clear winner was content with 51% of the vote. Cost came in a distant second with 16% and location was next with 13%. 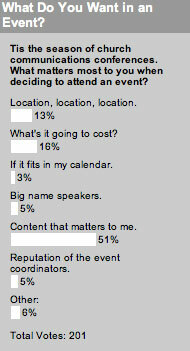 The big name speakers, reputation of the event coordinators and fitting in your calendar were all minor concerns with 5% or less each. We also had the open field “other” option on last week’s poll, though there wasn’t any clear consensus among the answers. Though one answer certainly sounded appealing: “Whether or not Kem Meyer, Mark Batterson and Brad Abare are buying dinner for the whole group!” That might just push me over the edge as well. This week we ask about the church newsletter. Seems pretty screwed up to me. There is a certain wow factor that I want when I go to a conference. I want to go back home with such big dreams of the communications paradise I’m going to create, that much of the content might be in a seemingly unattainable place, though it allows me to set big goals for the next year. Therefore, having big ticket speakers, making my budget, and a nice conference setting can factor in to my scale of priorities for a conference…. There’s always people to talk to these conferences to get relevant content that matters to me.